The following chapter takes place about midway through the book. It’s a tad light on the urban fantasy elements, but it makes up for that with a lot of fun. The six-cylinder, three-point-six-liter turbocharged boxer engine let out a deep growl as Michael pressed the gas pedal to the floor. An all-wheel-drive system and four fat contact patches on eighteen-inch tires helped transfer most of that power straight to the ground. Even so, the tires squealed on the wet pavement before they stuck. The country roads just outside the Covington estate weren’t built for high-speed traffic. The hills and trees impeded visibility and provided plenty of obstacles that the narrow, winding roads made it difficult to avoid. Fortunately, Michael had spent his teenage years driving these roads at far higher speeds than sanity would dictate. The wind and rain jostled them around bumps and potholes, but the Porsche Carrera 4 Turbo stayed locked to the pavement. Michael kept his eyes firmly fixed on the road. Through unspoken agreement, Peter watched for the Land Rover. It had enough of a head start to race well out of sight, and it carried an engine almost as powerful as the Porsche’s. But it also weighed twice as much and couldn’t maneuver along the curves of the country roads like the German sports car. Their first challenge approached as the road ended into another unnamed county highway. They’d have to pick a direction. Michael prayed as he eased on the breaks and downshifted. “There,” Peter called out, pointing to his right. Michael didn’t even look. Instead, he merely threw the car into a hard right turn and gunned the accelerator again. As they power slid through the stop sign at a speed higher than the posted limit, Michael caught the flash of red taillights. Peter slammed his fist into the dashboard in frustration as the taillights dipped under a hilltop about a quarter mile in the distance. But Michael knew these roads. This stretch would be almost perfectly straight well past the horizon. He pushed his foot to the floor. The engine roared as the little car gave him everything it had. The road hadn’t been paved in some time. At their speed, they felt every bump. The car rocketed over the hilltop at a hundred and ten miles per hour. Peter gripped the sides of his seat for all he was worth, as raw speed carried them airborne for nearly twenty yards. They landed hard, but square on the wheels. They skidded for a moment on the wet asphalt. Then the tires found their grip, and they rocketed down the road. On every turn, the squeal of tires pierced through, even overpowering the sounds of the torrential downpour. Lightning occasionally lit up the sky. Otherwise, visibility was terrible. “How can you see anything in this?” The nervousness in Peter’s ordinarily unflappable voice stood out like a sore thumb. Peter’s eyes popped out of his head. “You think he’s an Islamic terrorist?” Michael answered, genuinely surprised. Peter winced as they entered a windy section of road. Michael rode the center line, which allowed him to navigate the turns as an almost-straight line. Peter didn’t want to think about what would happen if they encountered an oncoming car in the other lane. As they pulled out toward the end, Michael caught a glimpse of headlights rising over a ridge and whipped hard back into his own lane. Peter knocked his head on the window and let out a groan. “Well, I don’t know if he’s Muslim,” Peter allowed. “Fine, not Islamic! But those things at the house and that yellow-nosed creature seem pretty terrifying to me!” Peter answered. Michael allowed that he had a point before responding to the original charge. “I was just driving fast for the hell of it. And maybe also because my blood alcohol content was twice the legal limit. So it was actually a lot harder to see.” Michael stated calmly. Peter stared at the crazy man in the driver’s seat. “Oh, some of my youthful ideas were far better than that,” he answered sarcastically. A family of white-tailed deer jumped out into the road in front of them. Tires squealed as Michael swerved right and brought the car to a complete stop. Peter’s face turned ashen, but Michael never lost his cool. He’d trusted the German engineering, and the gigantic anti-lock brakes hadn’t let him down. Michael smoothly shifted back into first gear. The instant the deer gave him an opening, he pressed firmly on the gas pedal and released the clutch. His right foot continued to press down, but nothing happened. Something blocked the accelerator. He looked down to find that the flashlight had rolled under the pedal. He kicked it out with his foot, mashed the clutch in again, and restarted the engine. He revved the flat-six engine high and popped the clutch out again. Four hundred and sixty-two horses squealed through the tires at once. When the tires finally stuck, the silver car took off like a jackrabbit on steroids. The Land Rover was once again out of sight. Michael pushed the car as hard as he dared on the wet country roads. It was faster than Peter would have liked, but the young man said nothing. Instead, he resumed his scan, trying to pick up any trace of Khalid’s getaway car. Another intersection approached. “Left!” Peter called out, pointing for emphasis. Michael lifted the parking brake handle and twisted the wheel, throwing the Porsche into a hard sideways slide. Before they’d even slid through the intersection, he gunned the accelerator again. The wheels screeched on the wet roads, fighting hard for traction, but eventually sticking. The car rocketed out of the turn. “I said left!” Peter shouted at him. “I know,” Michael responded calmly. “These old roads all come out at the same spot. This way’s faster – we’ll shave off some time and catch up to him.” Without warning, he braked hard and yanked the wheel hard to the left. Peter let out a small yelp and closed his eyes. A moment later, the dirt road ended. Michael took another hard right. The smoother asphalt allowed them to gain speed, but the road wasn’t much wider than the mud path they’d just left. They drifted around another hard turn before the way opened up. Michael took advantage of the straightaway and opened up the turbocharged throttle. He pointed across the field at a pair of headlights moving at an oblique angle toward them. They could see the SUV clearly now, even through the rain. The Porsche’s headlights illuminated it enough to be sure it was the right vehicle. As Michael had predicted, the two roads converged at an intersection ahead. Peter flinched as he saw the stop sign approaching. “Michael, that intersection is coming up awfully fast.” The bulky Land Rover loomed before them, growing quickly in their field of view. “Huh?” Peter said, double checking his belt. The crash came a few seconds later. 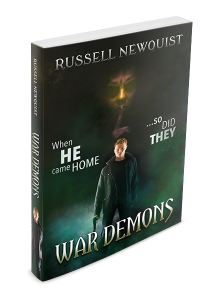 War Demons is available now in Kindle, paperback, hardcover, and audiobook formats!